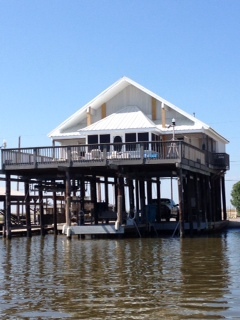 Lodging is available at one of many Houma hotels or camps on the water as well.. I will be glad to pick you up at one of these locations on the morning of our trip or give you great directions to meet me. Out of state fishermen can buy a 3-day charter passenger fishing license online or by phone. The cost is $10.00 while fishing with a licensed LA. charter captain. Call 1-888-765-2602 for license sales or LDWF website, online license sales. Let me know what your expectations are before our trip and it will help me give you the best trip possible. 12 Gauge shotguns minimum 26" barrel with modified chokes. 3" magnum loads in sizes 2,3 or 4 steel or other non-toxic shot. No waders or hip boots needed, just ankle boots or knee boots. I supply a cooler and ice so just brings drinks and snacks, adult beverages are okay for the fishing after the hunt. Polarized sunglasses, hat and sunscreen. Ice chest to bring home the fish. Camera and small gear bag. Snacks and drinks to put in my cooler. I supply top of the line fishing gear but you can bring your own if you would like to. CHECK OUT THESE FINE ON THE WATER LODGES.